Home > All Those Infomercials! The Flying Lure’s results were in. Our infomercial was a huge hit across America! People got the message and were trying the lure for the first time -- in numbers we had only dreamed about. What a great Christmas present that year! 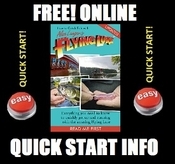 The Flying Lure infomercial became National Media's first worldwide smash hit – a decade and a half after the lure was first invented. 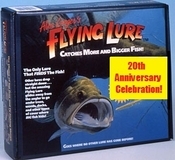 Graphic underwater footage of the lure in action, genuine testimonials, numerous "live-strikes" on-camera, a variety of species, a terrific offer, Jim Caldwell hosting... they all contributed to the unprecedented success of the Flying Lure. We went on to produce many domestic and international infomercials since that first 1991 show. The Flying Lure received incredible recognition in the mainstream press, with Advertising Age Magazine’s being the most satisfying. Not only did Bob Garfield, Advertising Age's resident critic, make it the first infomercial he ever reviewed... but in the End of Year Review issue of Advertising Age, he proclaimed the Flying Lure infomercial to be one of the "Top Five Commercials" of any kind -- beating even supermodel Cindy Crawford's iconic Pepsi spot! He said that we "crafted a relentlessly seductive, persuasive and tantalizing pitch for the Flying Lure... a phenomenal success."